Launched in 2009, Lessons In Loaf is a Real Bread Campaign initiative to share with school children that the life of a loaf starts in a field, not a factory. Lessons in Loaf: London sees the Real Bread Campaign team up with Grow Your Own Playground, whose experts will lead children on a fascinating journey from seed to sandwich. In addition to the valuable life skills of food growing and bread making, Lessons in Loaf: London touches on many curriculum subjects. For further details of all of the options, including costs, register your interest here. NB The content of Lessons in Loaf: London is devised and delivered by Grow Your Own Playground and differs from the Real Bread Campaign's original Lessons In Loaf guide. Any school in London can apply to take part in Lessons In Loaf: London. Thanks to the Worshipful Company of Bakers, five schools in Newham and Tower Hamlets taking the full Build, Sow, Grow, Harvest and Bake programme will be chosen to receive a grant covering half of the costs of the support outlined above. As an alternative to the full Build, Sow, Grow, Harvest and Bake programme outlined above, the Sow, Grow, Harvest and Bake programme excludes planter building, so is an option for a school with a suitable existing bed. Too late to plant wheat this year? Don’t worry, Grow Your Own Playground can arrange a bread making day. If you are unsure if this project will be possible at your school, Grow Your Own Playground can offer a consultation visit. Five schools on the programme will be supported by the Worshipful Company of Bakers, which can trace its origins back to 1155 and is the City of London’s second oldest recorded guild. The Company plays an active role in the continuing development of the baking industry and allied trades through training, scholarships and charitable support. Launched in 2009, Lessons In Loaf is the Real Bread Campaign’s original scheme of guidance and training to encourage people who can bake Real Bread to share this valuable life skill with children in schools. Between 2009 and 2013, Lessons In Loaf was funded by The Big Lottery’s Local Food programme. During this time, we received confirmation that more than 10,000 children at over 120 schools had learned to bake Real Bread thanks to our work. As our guides were downloaded more than 3000 times, the figure is likely to be much higher. We thank all of the Real Bread bakers, cookery teachers and other bread makers who gave up their time, and shared their knowledge and skills, to run these lessons in local schools in the name of the Campaign. NB Lessons in Loaf is a trademark of Sustain: The alliance for better food and farming. Published in 2009, the original Lessons In Loaf guide goes beyond the fun and practical life skill of baking. It includes lesson plans, recipes, information and ideas to help teachers get children at Key Stage 2 [as it stood in 2009] thinking and asking questions about the food they eat, where it comes from and how it is made. NB The content of this original Lessons In Loaf guide differs from the content of Lessons In Loaf: London, devised and delivered by Grow Your Own Playground. 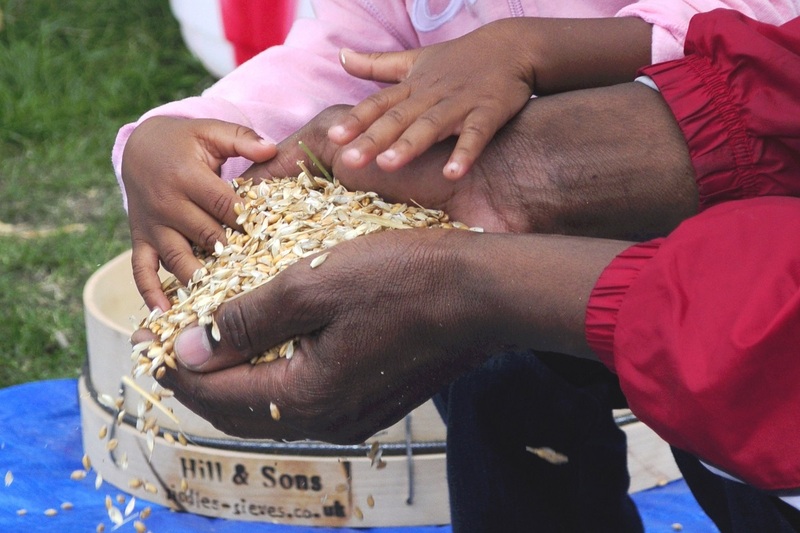 As a companion to Lessons In Loaf, in 2011, the Campaign published a guide on how kids can take a handful of wheat and grow it, mill it, bake it.